The Nashville Predators watch as the Pittsburgh Penguins celebrate winning the Cup in Game 6 Sunday night. 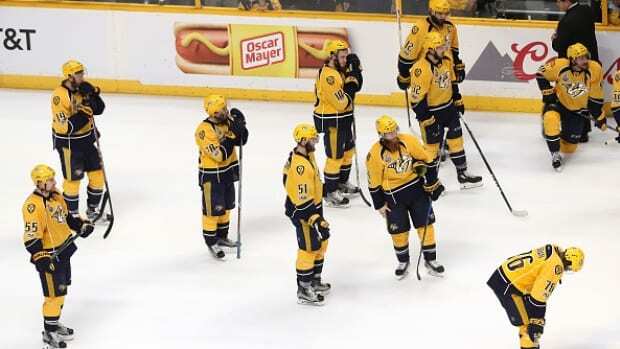 The Predators were shutout for the second straight game, 2-0 and lost the series 4-2. The Pittsburgh Penguins became the first National Hockey League’s first repeat champions since the late ’90s Sunday night with a 2-0 victory in Game 6 over the Nashville Predators at Bridgestone Arena. The game winning goal came with less than two minutes remaining in regulation (1:35) and was scored by a former Predator. Patric Hornqvist was the Predators final pick in the 2005 draft. His shot was banked in off Pekka Rinne’s left elbow, and was the only goal he allowed in another outstanding home performance. Carl Hagelin’s empty net goal only padded the final score. Sidney Crosby was awarded the Conn Smythe Trophy as MVP, his second consecutive one Crosby led the Cup Final in points with seven, getting one goal and six assists, three in the decisive Game 5 6-0 victory. But there was considerable question over whether Pittsburgh goaltender Matt Murray should have been the MVP. Murray shut out the Predators for the final two games, and was also the difference in Games 1 and 2, where the Predators outplayed the Penguins but were held off the scoreboard until Pittsburgh had late scoring flurries to break open both games. It was the Penguins fifth overall title, the most of any non-Original Six team. They also became the first repeat champions during the salary cup era of the NHL. Murray is the first goalie to win a clinching Cup Final game in each of his first two seasons. But for all that history, the Predators could point to an extremely controversial negated goal in the second period that could possibly have turned the tide. Colton Sissons scored just barely one minute into the second period, but it was disallowed because Referee Kevin Pollock prematurely blew his whistle, having lost sight of the puck. It was in the crease, and definitely should have still been in play. It wasn’t in the goalie’s possession, but once the whistle blew, play is immediately stopped. “I know he lost sight, and we all make mistakes,” Rinne told the Associated Press. “It was tough for sure.” “It’s going to sting, it’s going to hurt for a while,” added Predators’ defenseman P.K. Subban. This was the first loss for the Predators on home ice in the postseason, and they finished 9-2 for the playoffs at Bridgestone. But they also had to watch the Penquins hoist the Cup Trophy on their ice, with Pittsburgh coach Mike Sullivan becoming the first American born NHL coach to win two Cups. That had been the history that the Predators were hoping to achieve for Peter Laviolette. Still, despite the heartfelt loss, it was an amazing season for the Predators, and no one can dispute that.